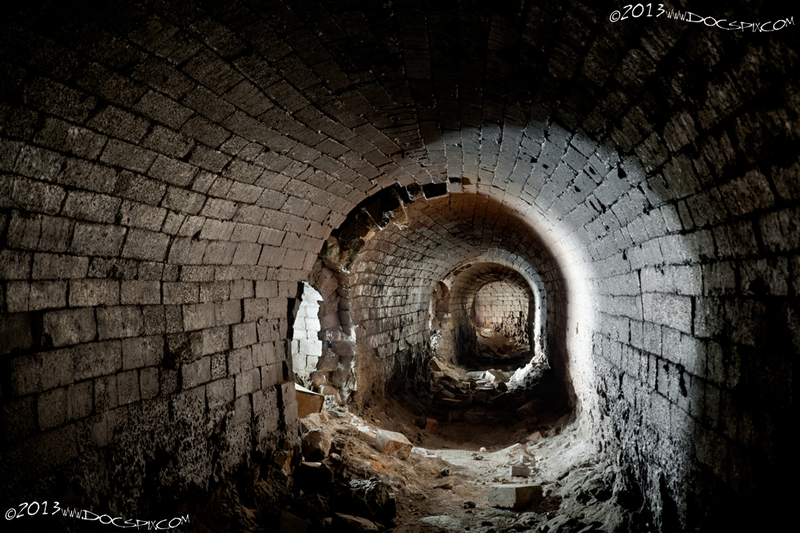 The Midwest Refinery had a series of tunnels that were used for both heat, (steam), and ventilation. 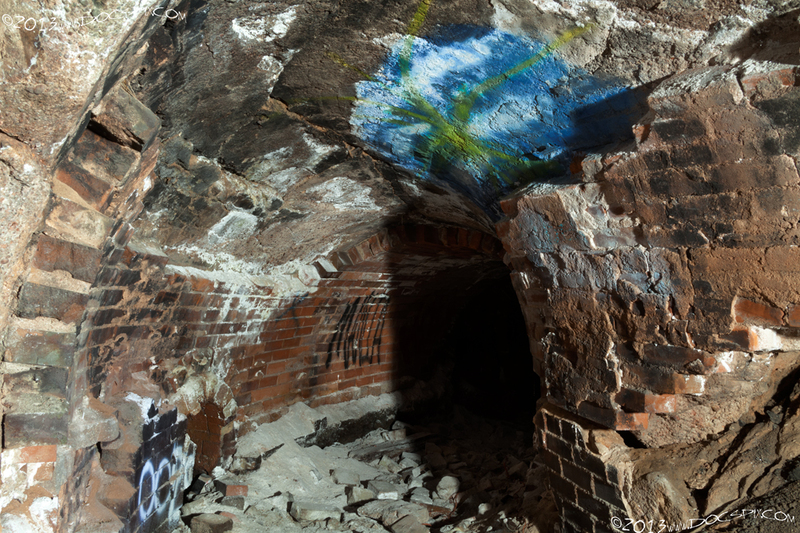 The tunnel pictured in this series had a chimney stack that was 150′ in height. The tunnel system was unique to the site in its construction – it was originally planned to be placed entirely underground; but wasn’t. The initial survey of the site revealed that the water table was at a depth of five feet, which might have caused the refinery not to be located here. However, the survey also found that there was a layer of limestone bedrock at a depth of fourteen feet – necessary to support the massive weight of the stills, (see the still pages for more details on the weight). 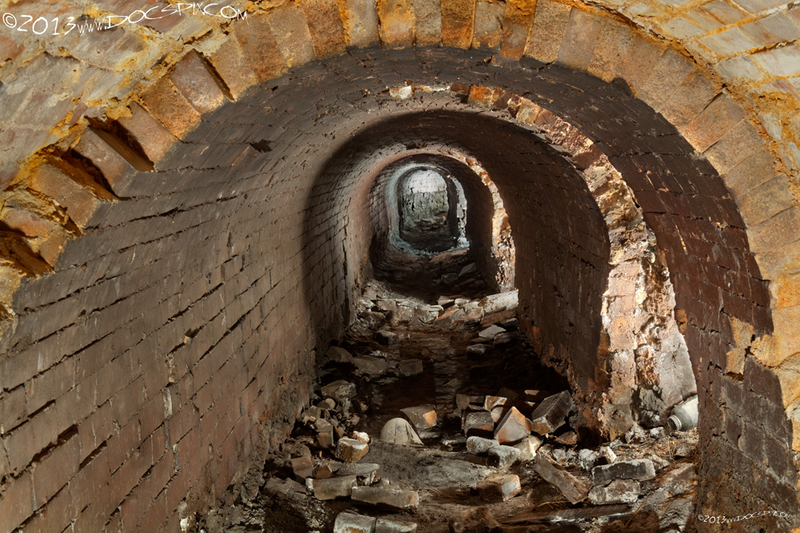 The tunnel system was constructed of brick, mortar, and was topped with concrete. The only remaining tunnel system that is accessible today runs the length of the eastern still bank along the south side. 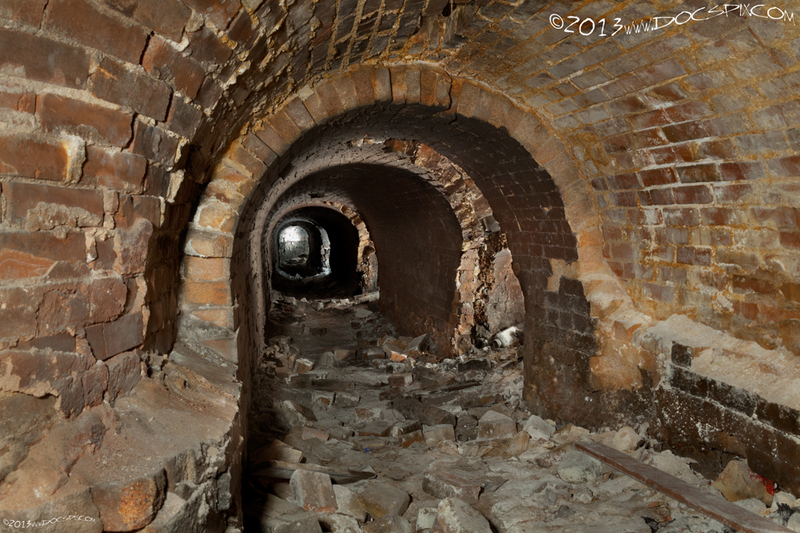 All of the other tunnels, (save for the one that resides in the building on the northwest corner), on the site are either inaccessible, collapsed, or have been filled in and sealed off. The smokestack for this particular tunnel was torn down probably after the refinery closed, leaving a large opening that leads underground. Each of the two tunnels extend fifty to fifty-five feet after the initial split. The smokestack this tunnel was attached to can be seen in this image from the Ludwig-Svenson Collection. 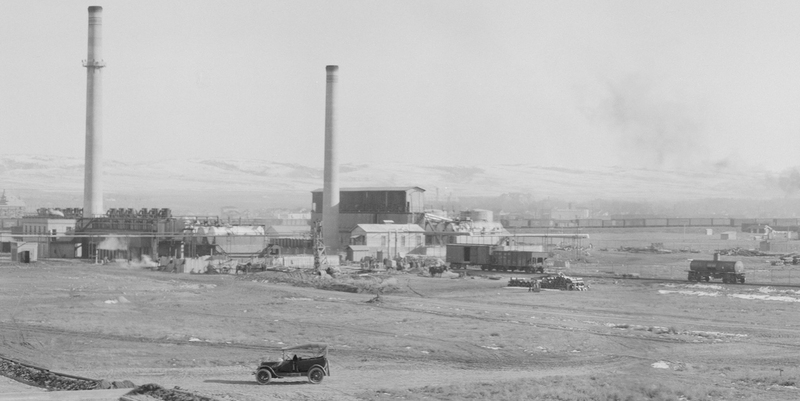 It is the smaller stack in the center of the image; both smokestacks were presumably destroyed shortly after the operations ceased in 1932. The larger smokestack and its foundation are no longer visible. However, its tunnel is still in place near the north still banks, and is mostly inaccessible due to its size. Undated image from the Ludwig-Svenson Collection,(digital archive), American Heritage Center, University of Wyoming. The “entrance” to the tunnel. It was originally connected to a chimney stack that was 150′ tall. A view from the top of the tunnel – it runs underneath the production line, (building eight). The tunnel entry. This opening is roughly 6′ high. 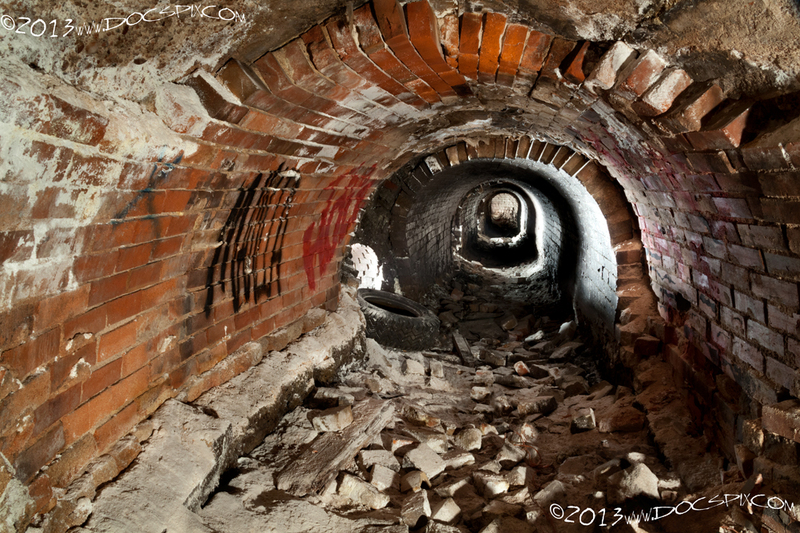 Another view of the tunnel entryway, the height is about 5-1/2′ top to bottom at the archway. A view of the right side of the tunnel entryway. Note the brick lining. Looking down the tunnel from the entrance. It splits some 40′ feet south. The corner that turns to the west tunnel has collapsed. Where the tunnels split, the height from top to bottom is about 5-1/2 feet. These both taper down across the fifty foot length for each tunnel to a diameter of about 24″. 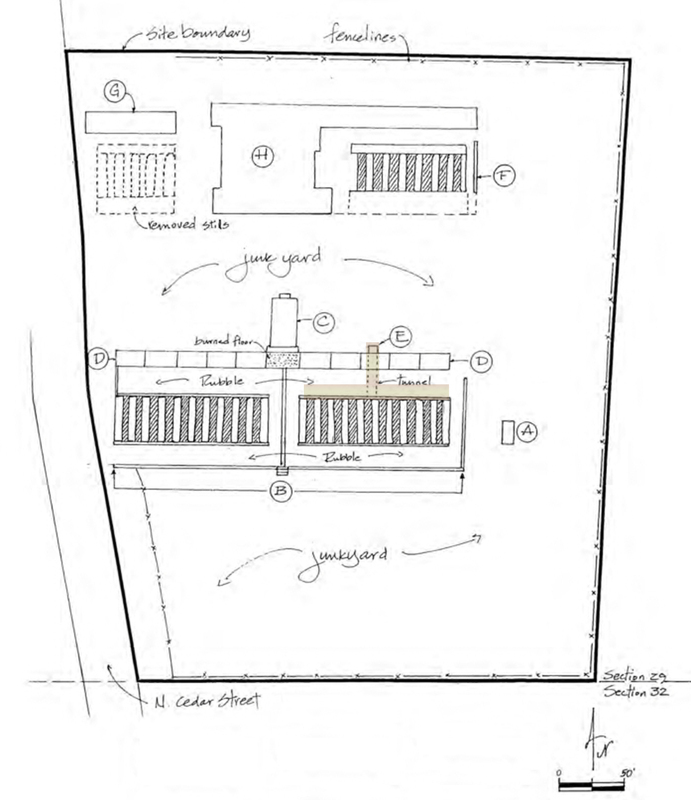 Each of the flues, or ventilation shafts is approximately 18-24″ in diameter. A view of the west tunnel. Note the flue on the lower left side; this was one of the six ventilation shafts used to expel the heat from the still operations; temperatures which may have reached as high as 800 degrees Fahrenheit, possibly higher. Three of the flues along the tunnel can be seen here, again these were used for exhaust ventilation for the stills. Looking westward from the location of the first exhaust flue. There are a total of six flues, including the last one. A view of the last three west flues. 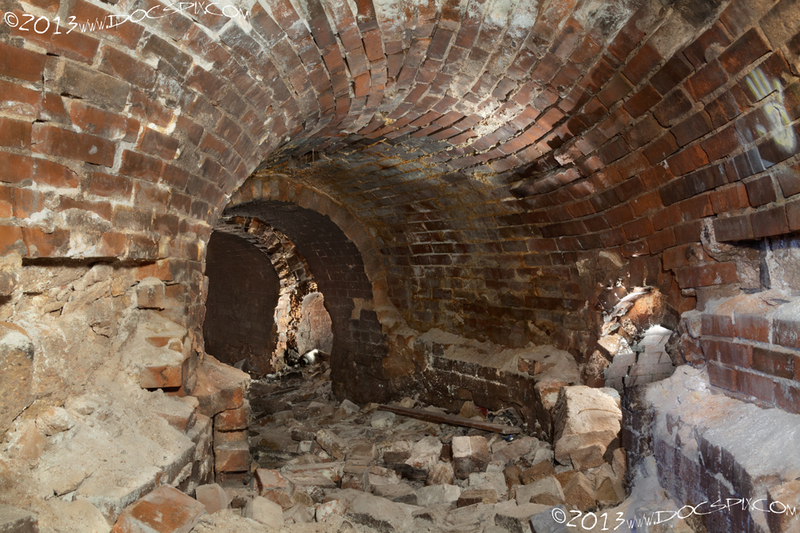 Although the tunnels were made of brick, the tremendous heat generated glazed the surface of the brick. There was probably some hot oil that was included in the exhaust. 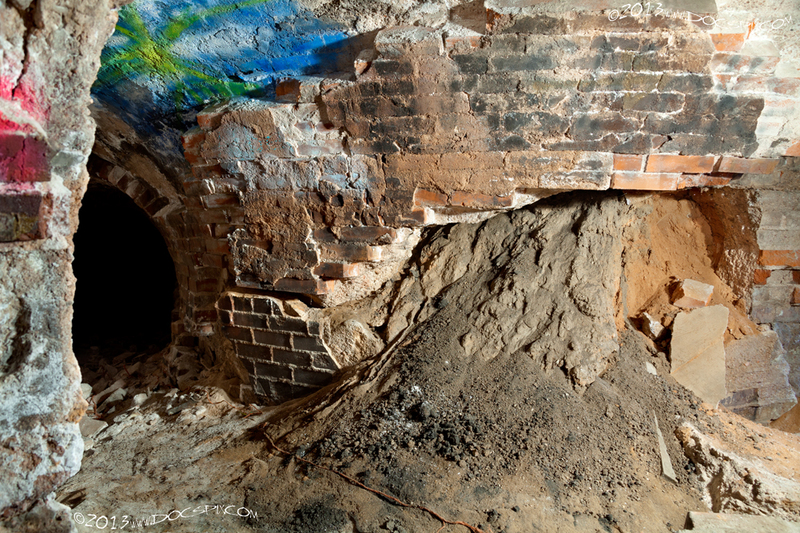 Two items of note here: the lower portions of the walls have bricks that appear to be melted; and, many of the bricks that lined the top of the tunnel have fallen to the ground. 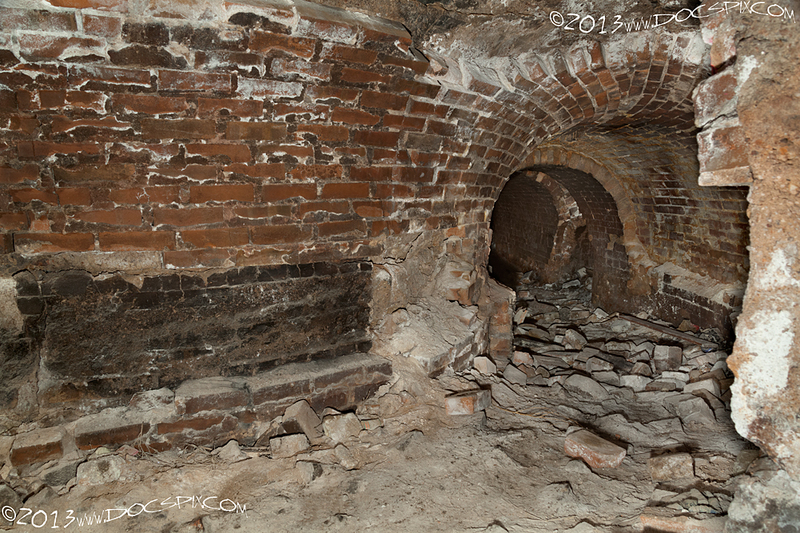 Similar to the west tunnel, the wall that makes up the corner is beginning to collapse. The first two flues can be seen here. The height of the tunnel here is about five-and-a-half feet. Looking east down the tunnel near the first flue. Another view looking east down the tunnel. There is some light visible from outside at the end – the last ventilation port hasn’t completely filled in with debris. 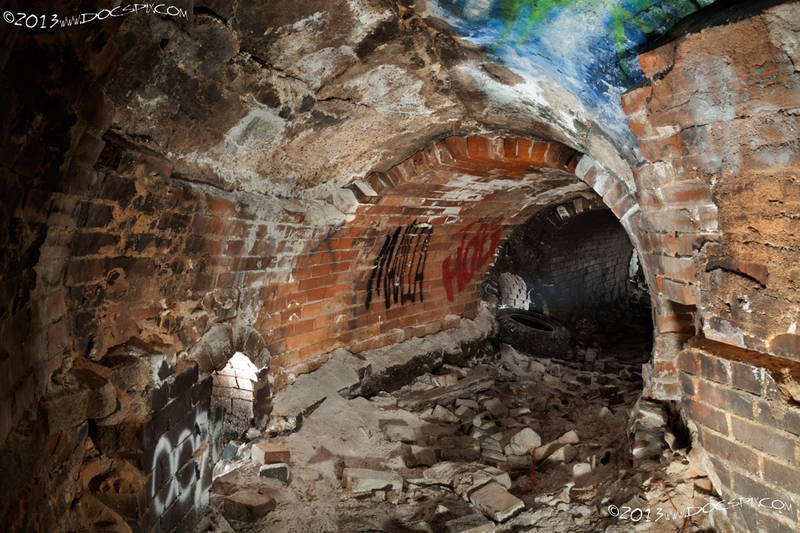 Similar to the west tunnel, this one also tapers down to a diameter of about twenty-four inches.